These glow-in-the-dark wind-up spooks can be handed out as a party favor for Halloween or monster themed party. They also make a great item to hand out to trick-o-treaters! 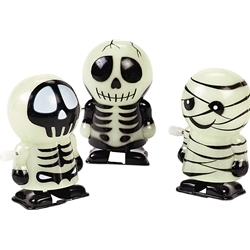 The glow-in-the-dark wind-up spooks are colored as pictured. Price is for one assorted wind-up spook.